Big Numbers #3, by Alan Moore and Bill Sienkiewicz (assisted, infamously, by Al Colombia). (Everyone’s posted this, but what the heck). Bits and pieces of it have been flowing around for years, but finally Pádraig Ó Méalóid has assembled the whole story and put it online. The quality is somewhat dodgy, but it is a thrill — albeit it a somewhat bittersweet one — to be able to read the third chapter in what for a brief moment after Watchmen had made its mark, was the Next Big Thing in comics, until it crashed and burned. A masterwork that never was. 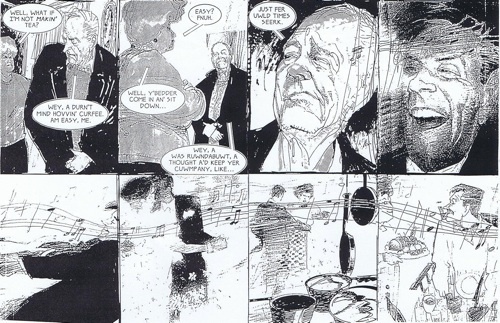 Also, read Moore’s original script here, and read Eddie Campbell’s typically insightful and entertaining commentary here. and more here. More Intelligent Life: “The Age of Mass Intelligence”, by John Parker. The Economist‘s rather too-hip-for-its-own-good subsite nevertheless offers some very worthwhile material. This article on the proliferation of high culture in Western society is interesting, as is this trenchant counterpoint, by George Balgobin.